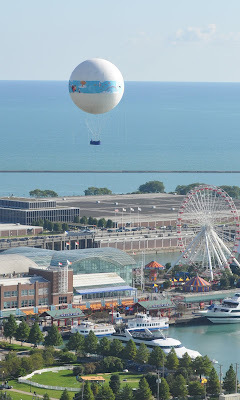 There's a new "ride" at Navy Pier. In addition to the Ferris Wheel, Carousel, various dinner cruise boats, and some spinning swing thing, there is now a balloon ride. It seems to just go as far as its tether will let it, which is fairly high (maybe 30 stories up). very nice idea! I agree with Vogon and Lois, it must be very fun and also with a beautiful view! That first photo is really good.